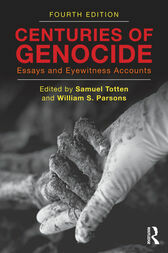 The fourth edition of Centuries of Genocide: Essays and Eyewitness Accounts addresses examples of genocides perpetrated in the nineteenth, twentieth, and twenty-first centuries. Each chapter of the book is written by a recognized expert in the field, collectively demonstrating a wide range of disciplinary perspectives. The book is framed by an introductory essay that spells out definitional issues, as well as the promises, complexities, and barriers to the prevention and intervention of genocide. To help the reader learn about the similarities and differences among the various cases, each case is structured around specific leading questions. In every chapter authors address: Who committed the genocide? How was the genocide committed? Why was the genocide committed? Who were the victims? What were the outstanding historical forces? What was the long-range impact? What were the responses? How do scholars interpret this genocide? How does learning about this genocide contribute to the field of study? While the material in each chapter is based on sterling scholarship and wide-ranging expertise of the authors, eyewitness accounts give voice to the victims. This book is an attempt to provoke the reader into understanding that learning about genocide is important and that we all have a responsibility not to become immune to acts of genocide, especially in the interdependent world in which we live today. Samuel Totten is a Professor at the University of Arkansas, Fayetteville, and co-founding editor of Genocide Studies and Prevention: An International Journal. He has also been a Fulbright Fellow at the Centre for Conflict Management, National University of Rwanda. William S. Parsons is Chief of Staff for the United States Holocaust Memorial Museum in Washington, D.C.